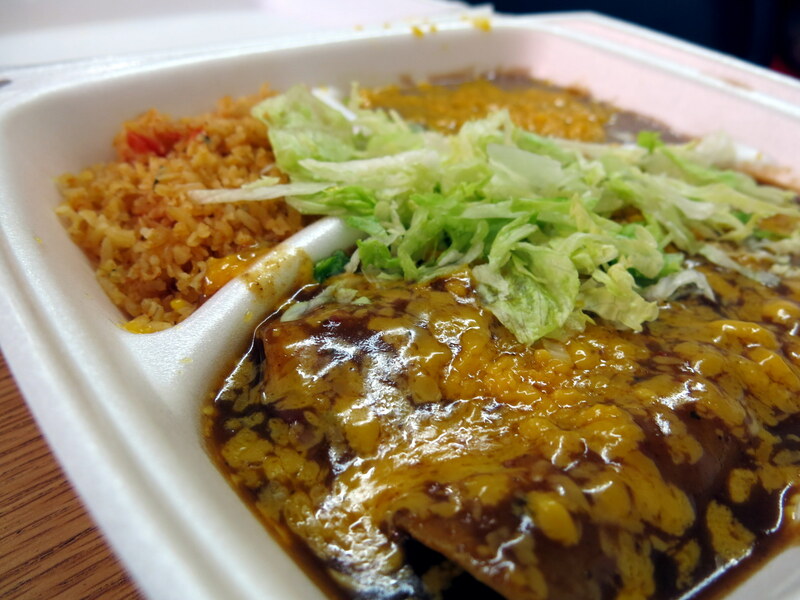 I’ve had some great Mexican food in Phoenix, so on my recent visit, I thought I’d press my luck, and looked up the most highly-rated places on the Yelp website. My favorite place (which I won’t name here, to prevent any confusion) ranked with 4.3 stars out of 5, so I was excited to find two other places ranking 4.4 and 4.3. This is a story of surprise and learning, so please don’t think it’s a negative review in any way. 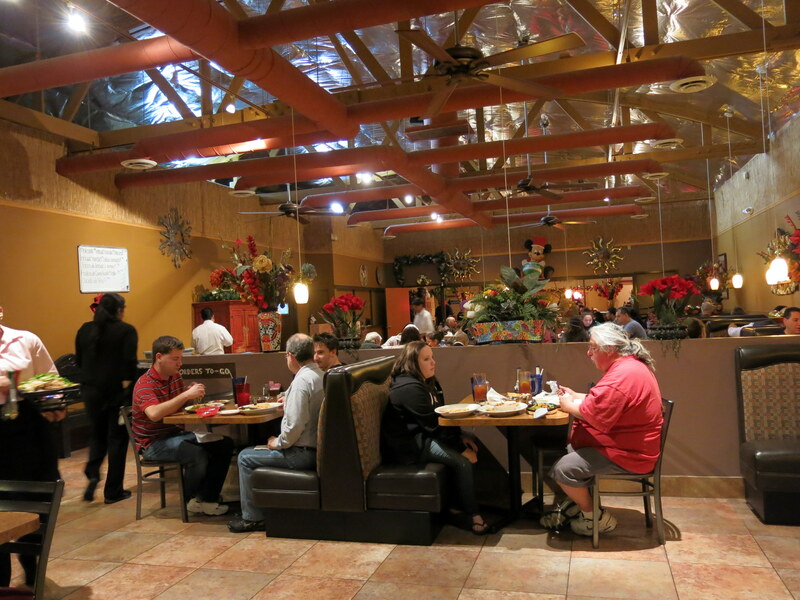 My sister and I drove across town from Scottsdale to somewhere south of downtown Phoenix to try Comedor Guadalajara. It’s a big, friendly place that feels as if it’s been there forever. The menu covered a wide range of meat and seafood dishes, and choosing was difficult. We started with ground beef and mashed potato tacos, which was our first surprise. I’ve become a fan of crispy mashed potato tacos in Los Angeles, but somehow, the addition of ground meat made them taste a little more like something my mother might have made (she was not Mexican.) They were good, but didn’t have the toasty, starchy edge I was expecting. As a main course, I ordered the camarones endiablados, a spicy shrimp dish I’ve had many times in Mexico and Los Angeles. It was nicely presented, with rice and refried beans, and delivered all the chipotle zing that the menu promised… except that it tasted just like barbecue sauce. Leigh ordered chicken enchiladas that were also nicely presented, but in a creamier sauce than expected. 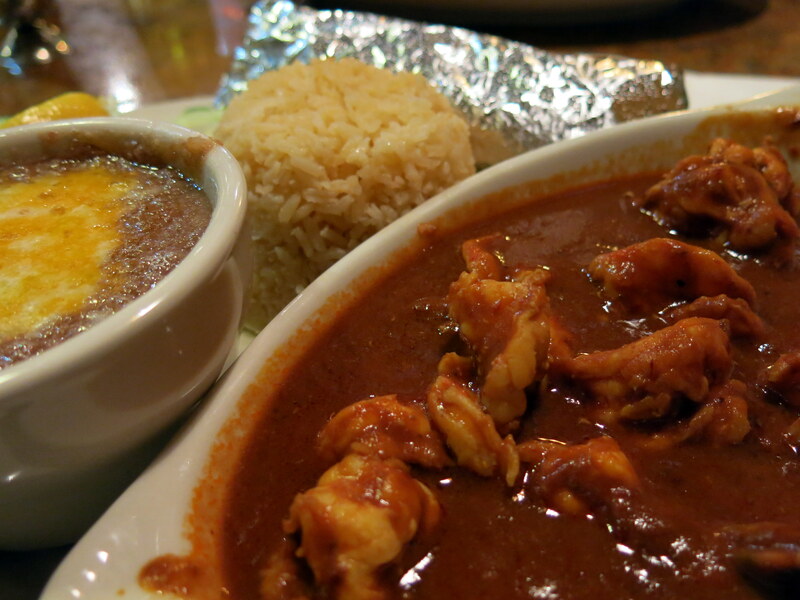 Everything was tasty, but we’ve never been served dishes like these in Mexico or Los Angeles. We realized we were eating something similar, but not quite like Mexican food. The next day, we went to another famous place. For years, my sister has told me about the buttered tortillas at Carolina’s, which is located just a few blocks from Comedor Guadalajara. 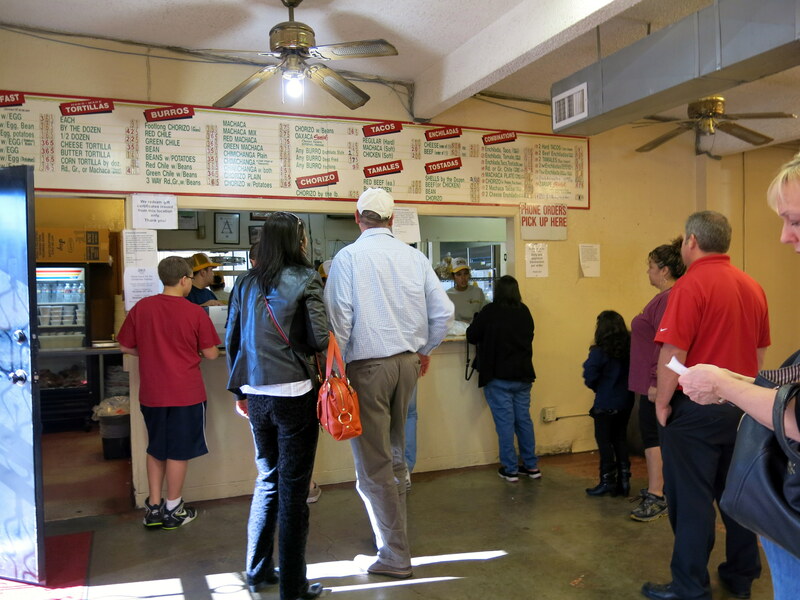 They turned out to be large flour tortillas, slathered with butter, and folded into an intense, comfort-food ball that will probably be the subject of dreams and fantasies until the next time I’m in Phoenix.The location, however, was a surprise. Leigh had never actually been to Carolina’s, and the free-for-all of the busy down-scale room turned out to be a lot of fun. The menu was surprisingly limited, with burritos, chimichangas (deep-fried burritos, I was told) and enchiladas being the basic fare. I went for the enchiladas, and Leigh had the chorizo and potato burrito. My enchiladas came in a plastic container, and were covered in a deep brown sauce, melted orange cheese and shredded lettuce. Served with refried beans and rice, they were tasty, but again, unlike anything I’ve had in Mexico or Los Angeles. Leigh’s burrito, however, was wonderful! I’m sure I’ll be going back to Carolina’s. We spoke with a well-known Mexican chef the following day, asking him just what it was that we had eaten. He was quick to point out (and I agree 100%) that these are good restaurants, but it really isn’t Mexican food, but rather some form of Tex-Mex. Both places have been around for years, and were full of happy diners, so we came away feeling we had learned something valuable. This entry was posted in Food! and tagged Burritos, camarones, chimichanga, diablados, Enchiladas, Mexican cuisine, Phoenix, Tex Mex by brucecritchley. Bookmark the permalink.